In the world of gardening, it is a truism that as gardens mature they tend to become shadier, a situation that can cause problems for those of us who grow roses. We all know that roses, especially the hybrid teas, need a minimum of six hours of sun if they are to produce their spectacular blooms—and that’s the reason we grow roses, after all. However, there are some roses that will fare well in partial sun locations, those areas that can provide three hours of sun. There are some caveats to growing roses in less sun: Their blooms will be smaller and less profuse. The upside is that they will require less water and less fertilizer. The first thing you have to do is to look objectively at your garden, observing when and where you have sun. You can easily be fooled into believing you have more sun than you actually will have in June, when the roses really, really want that sun. The next thing you must do is to research those roses that can tolerate shade. Many of these are old garden roses but there are also climbers and ramblers on the list, along with Chinas and shrub roses. If you find you have a lot of sun in April but much less in June, you can always opt to use an early blooming rose, such as ‘Old Blush’ or the lovely Rosa banksiae, the Lady Banks Rose, which bloom early and profusely but are not remontant (repeat flowering) roses. Along with ‘Old Blush’ and Lady Banks, seek out the always-reliable ‘Cécile Brünner’ in both the climbing and shrub forms, Rosa chinensis ‘Mutabilis’, and ‘Marie Pavie’. A Bermuda rose, ‘Spice’ has done well in my garden where it only receives two hours of good sunlight. A rose to seek out, but one that can be hard to find, is R. moschata nastarana, The Persian Rose, which the late J.C. Raulston declared was the most disease-free rose at the JC Raulston Arboretum. Generally, most of the roses that can tolerate more shade are single rose varieties. Another added positive is that many have good disease resistance. There is one thing to be aware of however: it took my Lady Banks three seasons before it felt like growing and producing blooms. 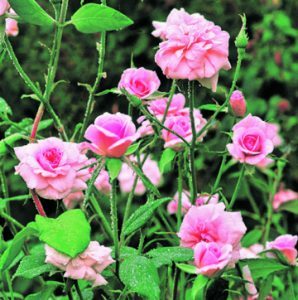 Consequently patience is called for when growing these roses. If it is already too hot by the time you read this, spend the summer researching appropriate roses to plant in areas of your garden that receive three hours of sunlight. 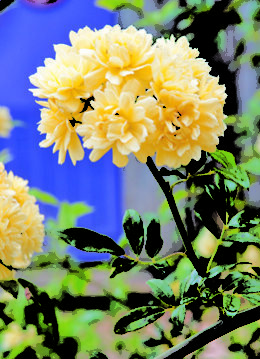 By September you will know where to plant and which roses you want to plant. And, September is a wonderful time to plant roses. Photos courtesy of The Antique Rose Emporium. A serious gardener for the past twenty years, Kit Flynn resides in Chapel Hill. She is also a Durham Master Gardener. 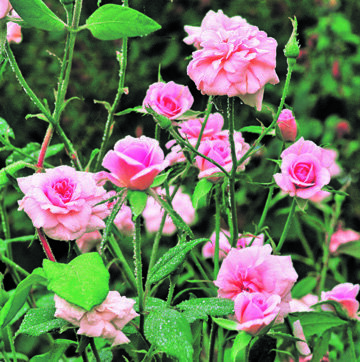 Are You Growing Own-Root Roses?